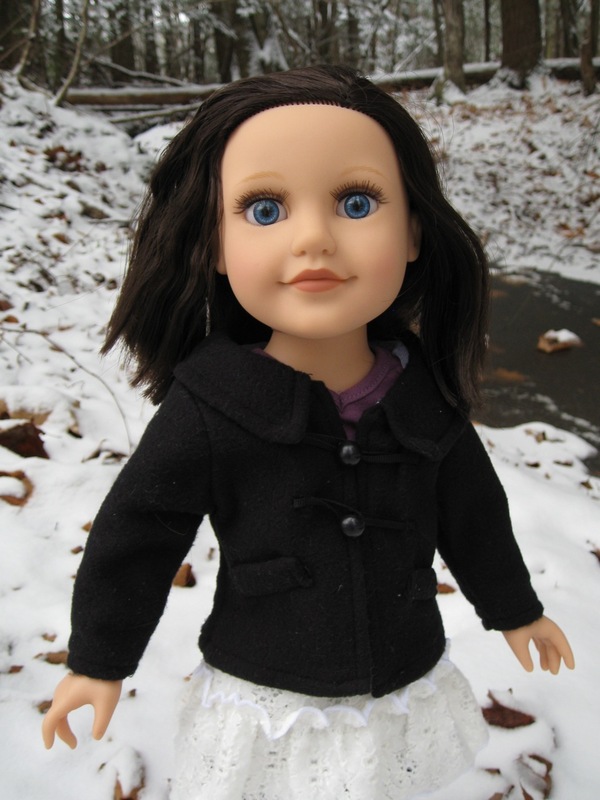 In my part of the world, there are four inexpensive and readily available 18" play dolls that provide an alternative to the more expensive options like American Girl, My Twinn and Carpatina. Target offers the Our Generation line by Battat, Walmart sells the My Life As dolls by Madame Alexander, AC Moore has the Springfield Collection girls, and Toys R Us carries the Journey Girls line. I have reviewed the Our Generation dolls and looked at a My Life doll, and have been eager to see how these dolls compare to the Journey Girls. When I'm browsing at the store, the Journey Girls always stand out to me because of their vinyl torsos, expressive faces and pretty eyes. Journey Girl "Dana," by Geoffrey, LLC (Toys R Us). While I was waiting for my 18" Annie doll to arrive, Connor gave me a tip to go check out some wonderful flickr pictures of a highly-articulated 14" Disney Ariel doll made by Zapf Creation. As Connor noted, I am a big fan of articulated dolls, Disney Princesses and redheads, so the tip was perfect for me (thank you, Connor!). I also like the Zapf company quite a lot and tend to be impressed with the quality of their dolls. Given all of this, it should come as no surprise that I went directly from the flickr pictures to the online shops, trying to find one of these Zapf dolls to review. The dolls are not easy to find. I don't think they've ever been for sale in the United States and it seems like they are now discontinued. Limited quantities remain for sale online--often at dramatically marked-up prices. I believe these dolls were first made in 2010 and retailed for around £25. If you live in Europe, you can probably still find a doll at a reasonable price: Amazon UK currently has Ariel for £15 and Puppen Toys in Spain has several of the dolls at retail. Here in the United States, it seems to cost $50-100 to bring home one of these princesses. 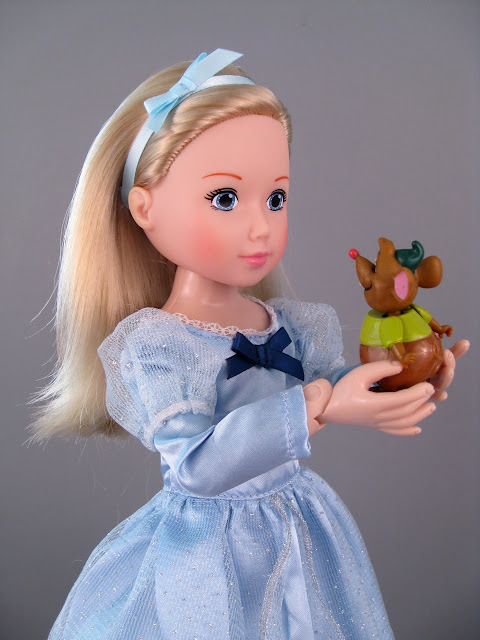 Fishpond.com has the best deals that I could find, and they are willing to ship internationally, but they don't have many dolls left. "Little Princess Cinderella," by Zapf. The Disney Store's "Anna" and "Elsa" from the Movie "Frozen"--A Guest Review! I bought the Disney Store's "Anna" doll many weeks ago. Even though the Frozen movie hasn't been released, I could not resist this doll's red-headed, freckled face. Unfortunately, I haven't been able to find the time to write a review yet, because too many other exciting things have been happening in the doll world. Imagine my happiness when Julia emailed to ask if she could do a guest review, and the doll she wanted to review was...Disney Store Anna! To make it even better, she has Elsa, too. I am so grateful that she came along at just the right moment to make this review possible. I'm going to turn most of the review over to Julia, but I'll chime in at the end with a few of my own observations--you know, after Julia has done all of the hard work. Over to you, Julia! 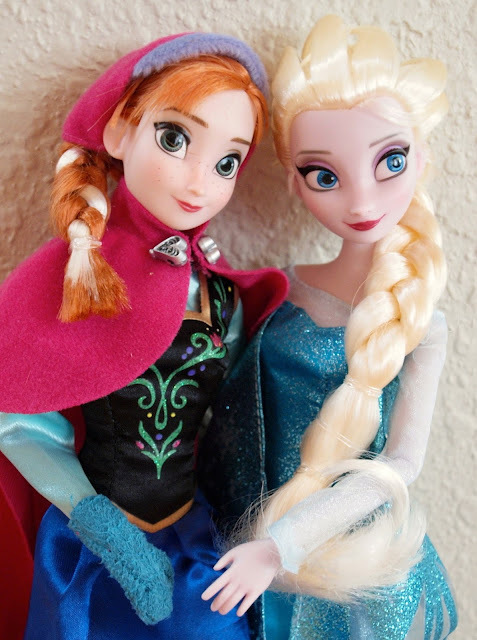 "Anna" and "Elsa" from the Disney movie, Frozen. My Twinn 18" Custom Doll, "Annie"
I have mentioned before how the expectations and anticipation surrounding a doll purchase can play a large role in my overall assessment. Because of this, ordering a custom doll like a Makie or a My Twinn can be quite risky. In the days or weeks that it takes for the doll to be made, a very clear vision of that doll will form in my mind, making it difficult for the actual doll to be what I was hoping for. On the other hand, the process of customizing a doll is very fun, and the excitement of waiting to see that special doll adds significantly to the purchasing experience. 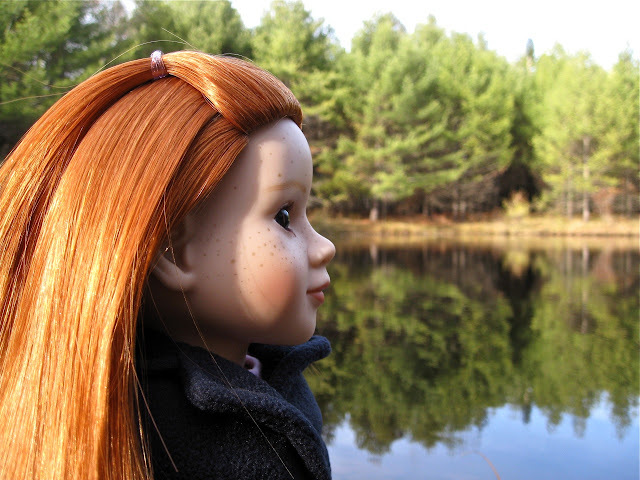 If you read my earlier post, Waiting for Annie, you know about my previous experience with ordering a custom My Twinn doll--how I was hoping for a redhead and got a doll with dirty blonde hair. If you read that other post, you might also have had some time to form your own ideas and opinions about how my new custom 18" My Twinn doll, Annie, should look. My own wishes for this doll were that she would have bright red hair, beautiful green eyes and a huge number of realistic freckles. 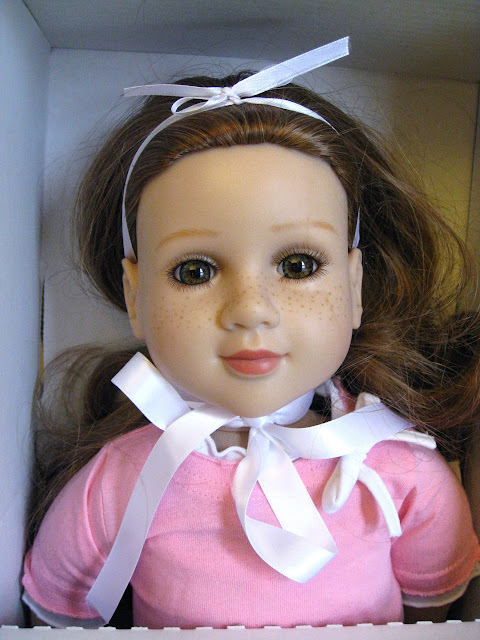 My Twinn 18" custom doll, "Annie." Monster High Power Ghouls "Cat Tastrophe"--A Guest Review! Today I am so pleased to be able to present a wonderful guest review! The author is known around here as Toy Town, and she has generously offered to share beautiful pictures and first-hand opinions of a doll that I have been unable to get my hands on--the elusive Cat Tastrophe! I was super-excited to get these photographs in my inbox, and I hope you will enjoy them as much as I do. Over to you, Toy Town! Hey everyone, Toy Town here. Today, I will be doing a guest review on Monster High Power Ghouls: Cat Tastrophe. I saw this doll at Target for $21.99 and I literally jumped up and down. I really did not care about the people staring at me, I mean, who wouldn't jump up and down, we have been waiting for a new Toralei doll for like millions of years...or, maybe a year or two. There were three of them and the other two had really wonky eyes, and one of them is a little bit cross-eyed. Thank goodness I was able to find one with nice features. Just a little heads up, if you guys still don't have a Toralei doll, DO NOT lose hope because there's going to be more Toralei dolls in the future. There's going to be a "Coffin Bean: Toralei" doll probably early next year and rumor has it that there's going to be a "Ghouls Alive: Toralei" doll. Monster High Power Ghouls, "Cat Tastrophe." 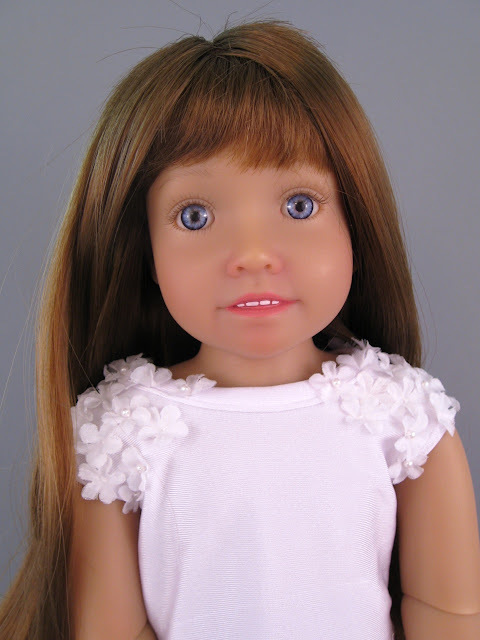 As many of you know, My Twinn has recently released an 18" version of their customizable dolls. I caved to that temptation pretty quickly and ordered a doll who I've named Annie. I had a wonderful time with the 23" My Twinn Adopt A Friend dolls back in March, and my adopted friend Hazel remains one of my favorite larger girls, so I am excited to see what the company does in the smaller, more popular 18" scale. I was thinking, though, that waiting for a customized doll and wondering what she'll look like is half of the fun. My 18" Annie should arrive this week, and so I thought I would share some of the last-minute anticipation with you. My Twinn "My BFF" doll (23 inches). Not the new 18" doll. Kidz 'n' Cats are slim, articulated 18" play dolls designed by Sonja Hartmann for the German doll company, With Heart and Soul. These dolls were first introduced in 2009 with a small collection of seven dolls bearing two different face molds. Since then, three new faces have been added and a total of 37 dolls have been released. The collection is named for the fact that most of the dolls are accompanied by a small plush cat dressed in a matching outfit. I have been interested in these dolls since 2009. I have always appreciated the fact that Sonja Hartmann designed an 18" play doll with multiple joints, offering a welcome contrast to the relatively inflexible dolls like American Girl, Carpatina and Magic Attic. I also admire the realism in the Kidz 'n' Cats features. These dolls do not have exaggerated proportions like large eyes or huge heads, but rather strive to accurately represent the features of real children. I also enjoy the funky, wholesome way that Kidz 'n' Cats dolls are dressed. They come in a colorful variety of multi-piece outfits made from an array of eye-catching, differently textured fabrics. Kidz 'n' Cats "Evita," by Sonja Hartmann.